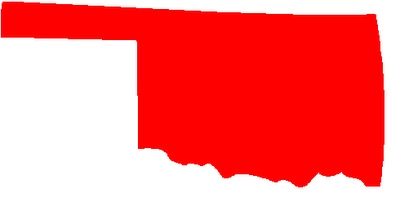 With the Oklahoma House calling it a year last Friday (May 22) and the Senate belatedly following suit this past Wednesday (May 27), legislative action in the Sooner state came to a close until 2010. [Both chambers closed up shop prior to the May 29 deadline for legislative adjournment.] The end of the session means that legislation stuck in committee remains in limbo to some extent. The legislature rules allow for such legislation to carry over from an odd-year session to an even-year session, but it is unclear as of now as to whether HB 1340 will be one of those bills. As we've talked about since January, this bill would shifted the financial burden of the presidential primary system in Oklahoma from the state to the state parties. The parties would set the candidate filing fee at a certain level in order to fund the election. This isn't a first, but it does go against the trendline on this particular issue. The movement has been toward primaries; specifically primaries operated on the state's dime. South Carolina had been the only remaining party-run primary until 2008 when the state legislature over-rode Mark Sanford's veto. That bill allowed state funding of the contest but let the parties determine when they were to be held (a provision that allowed the Palmetto state to maintain its first in the South status) and is what continues to differentiate the South Carolina primary from other primaries. HB 1340 would have made Oklahoma similar to South Carolina pre-2008. Again though, this bill could be resurrected during the 2010 session and may find more support if the economy continues to stagnate. Then again, if the economy was an issue in this decision, it is hard to fathom why action was not taken during the 2009 cycle. The efforts in Illinois General Assembly to split off the state's primaries for statewide and local offices from the presidential primary looks to have failed. Last Friday (May 22) was the last day for House bills to receive a third reading in the Senate (and likewise Senate bills in the House) and be passed before the Assembly adjourns on May 31 (this coming Sunday). Neither of the efforts to move the state primaries to March or June made it out of committee. 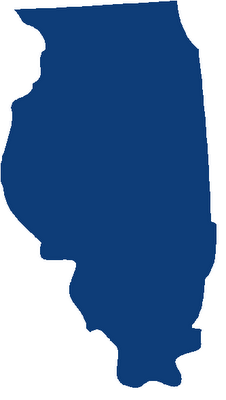 For now that keeps Illinois' congressional primaries in February; the earliest such primaries in the country. The US has obviously become more accustomed to lengthy presidential campaigns, but the Illinois congressional general election campaign lasting nine months was a record in 2008. At issue are the savings the state gains from holding the two sets of primaries together. And in this economy, state legislators are hesitant to sign off on any measuring that would see the budget balloon any further. Of course, around the state there has been some level of displeasure with the burden the early date and even earlier filing deadlines places on prospective challengers to incumbents in these primaries. But that fact has been outweighed by the need to save money in a difficult economic climate. Does the Sotomayor Choice Make Texas a Swing State? The real reason FHQ now has a presence on Twitter is because I wanted to check out the involvement the top contenders for the 2012 Republican nomination have on the service. To me, that was the easiest way to answer the "How much is Twitter worth?" question. And the resounding answer to the question was, "A lot." With some caveats, all of FHQ's Elite Eight candidates for 2012 have a Twitter account and use them with varying levels of frequency. For instance, Newt Gingrich, Sarah Palin and Mike Huckabee tweet quite a bit -- multiple times a day and every one of those Elite Eight (plus Bobby Jindal, John Thune, Haley Barbour and John Ensign) have at least put something up in the last week. But who's watching? A Twitter presence obviously doesn't amount to much if no one is paying attention. Newt Gingrich, for instance, just yesterday made a couple of Sotomayor-related comments (here and here) that netted the former Speaker an additional 5000 followers. That is a drop in the bucket compared to his total number of followers, but that influx amounts to about a fifth of the total number of followers of the next highest prospective candidate, Sarah Palin. 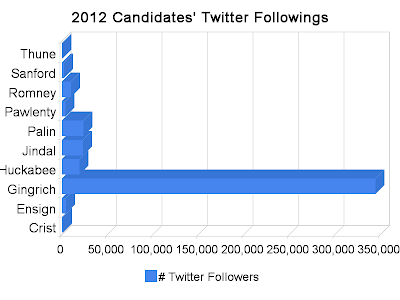 To what extent, then, are the potential 2012 candidates being followed on Twitter? As of yesterday around this time, Newt Gingrich had about 344,000 followers of his Twitter feed. For the sake of comparison, Barack Obama has about 1.3 million followers and FHQ has 1. Gingrich's total dwarfs all the other possible candidates and skews an otherwise nice figure. As such, let's remove the former Speaker and look at the remaining nine likely possibilities. Basically, you have the troika of Palin, Jindal and Huckabee and then everyone else. Those three all offer relatively frequent contributions -- though Jindal has been quiet in May compared to April -- and that certainly helps augment their follower totals. Sure, Mitt Romney is there too, but that feed has but one tweet and overall is likely hampered by that fact -- in terms of Twitter at least. Charlie Crist is also hurt by the fact that he has started a feed to coincide with his Senate run announcement. In other words, that one has only been active for a couple of weeks. Now, what does all of this mean? Well, tracking Twitter followers is interesting, but as is the case with Google Trends data, not without shortcomings. The main issue is whether those followers are active or if they are Twitter quitters. Gingrich has a solid total, but what if, say, a third of those followers aren't actively following anymore? [Well, that still beats everyone else, doesn't it?] Of course, it is more damaging when you consider the 60% drop off Nielsen found. Still, I think this is another layer that can be added in to the candidate emergence picture. Two Huckabee Slips in One Day? To quote Fred Flintstone, "That's the camel that broke the straw back." FHQ has finally broken down and joined the "tweeting" ranks. It may in fact just be a fad, but I can no longer justify shrugging the service off because of its overly short messages. In real time, nothing is more powerful for dispersing messages quickly and that has distinct ramifications in the political realm. We saw that with the Oklahoma Republican convention a few weeks ago. The mainstream media was not covering the GOP chair battle in Oklahoma -- the one that potentially would have had the party adopt a presidential caucus over the state-funded primary. Plus, the political world seems to have adopted Twitter as well (see picture to the right). 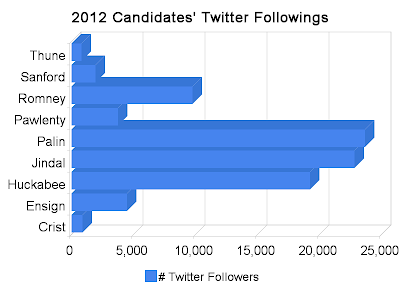 All of the possible candidates mentioned for the GOP nomination in 2012 have at least some presence on Twitter. In fact, you can now see their up-to-the-minute updates in FHQ's left-hand sidebar below the blogroll (Yes, way down there.). To go to the candidate's Twitter page simply click on the "about _ hours/minutes ago" link or just follow along here. I'll have more on this tomorrow, but for now a few notes about the sidebar gadget's functionality will suffice. As for FHQ, you can add our Twitter feed (@FHQ) if you are so inclined (There is a link to the feed in the right sidebar above the Blog Archive). For now, my contributions will be confined to automatic postings of actual FHQ posts with attendant URLs, but that could change in the future. My feeling is, why deprive loyal FHQers of the opportunity to follow the site in a more mobile format if that's what they prefer. Like I said, though, I'll have more on this tomorrow. In the meantime, have fun with the new gadgets. NOTE: Also, please let me know if you experience any lags in site loading time when you're here. Adding these gadgets has slowed things down some and I want to keep tabs on that. Thanks. Is Charlie Crist Running for Senate or Vice President? Matthew Dowd thinks it might, depending on how Republicans in the Senate handle the Sonia Sotomayor nomination to the Supreme Court by President Obama. “If they don’t get back to a place where they are getting roughly 40 percent net of the Hispanic vote, there is no way they can ever win,” [Dowd] said. Now, Dowd was talking in national terms when mentioning that 40% barrier, but let's look at this within the context of Texas. Hispanics made up a shade more than a third (36%) of the Lone Star state's population in 2007 according to the Census estimates and comprised approximately one-fifth of the 2008 electorate there (based on exit polls). In raw data terms, that's 8.8 million Hispanics in Texas, 1.6 million of which voted. In November, Obama won 63% of the Texas Hispanic vote while losing by just shy of one million votes to John McCain overall in the state. That left Obama with a +450,000 vote "Hispanic margin." In other words, despite beating McCain by nearly half a million votes among Hispanic, the president still lost by one million votes in Texas. But the question is: How many Hispanic voters would be energized by a controversial Supreme Court confirmation process involving the first potential Hispanic justice, and would that be enough to overcome that one million vote deficit? Possibly. On one hand, Texas is growing at a pretty good clip and a lot of that growth is Hispanic growth. But on the other hand, Texas, in a more competitive environment, would likely see increased turnout. The former is much more difficult to simulate than the latter, but let's look at turnout first and see if we can get at least half way to an answer to this question. First, let's construct a model based on the 2008 election data we have. If we regress FHQ's final polling margin averages by state, number of electoral votes, and a state's party lean (a dichotomous variable where 1 = Democratic lean and 0 = Republican lean)* on the final turnout figures from 2008, we get a decent model for the purposes of prediction (The R-squared isn't great -- .3 -- but let's keep this simple.). In reality, Texas had a 54.7% (voting eligible population) turnout rate in 2008. 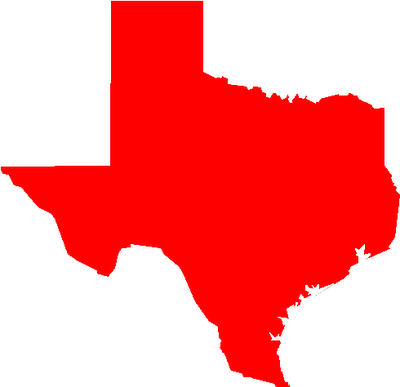 Under this model, however, the Lone Star state is predicted to have had a turnout rate of 57.6%. In other words, we have some error present; most likely due to some level of omitted variable bias. Again, though, simplicity is the goal here, not elegance. That said, if we assume that Texas was a dead-heat in the polls leading up to the election (I dropped the +11.66 McCain advantage in the polls down to a +0.66 McCain lead), the turnout rate would have increased to 60.1%. 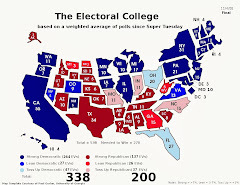 Now, if we assume the same exit poll distribution among racial categories prevailed in the Texas electorate -- 20% Hispanic, 63% of which voted for Obama -- the president would have inched approximately 50,000 votes close John McCain. That's a drop in the bucket when compared to a nearly one million vote deficit. But if we assume that the GOP caucus in the Senate balks at the Sotomayor nomination, damaging the party's standing with Hispanics even further, that mere drop in the bucket may turn into a tide against the GOP in state's with a dense Hispanic population. 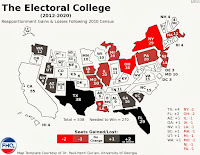 For example, if we assume, based on 2008 population and turnout statistics, that the Texas electorate was 25% Hispanic (instead of 20%), 75% of whom voted for Obama (up from 63%), the president would have increased his Hispanic margin from 450,000 votes to over one million votes relative to McCain. That half a million vote difference would have cut McCain's statewide advantage in half assuming all other racial categories behave as they actually did (in terms of percentages of the electorate) in the 2008 election. The problem here is that this simulation is done in terms of the 2008 election; an election that is obviously in the history books. What's missing, then, is an accounting of the population growth to occur between now and 2012 (Oh, and the actual level of incitement a fight over an Hispanic Supreme Court nominee triggered. But that's a different story.). If you look at the Election Data Services estimates (Table B), it looks as if Texas has gained between 400,000 and 500,000 people every year since 2000. That would place the state's population at somewhere around 26 million people in 2012. If the same 60.8% of the population was voting eligible at that point -- and that doesn't include latent Hispanic voters activated by a court nomination fight -- there would be approximately 16 million voters in Texas in 2012. One thing to note is that we are assuming uniform growth across all categories of ethnicity. In other words, the expansion of the Hispanic margin between the Democratic and Republican candidates would be counteracted by a similar increase in the white margin. As noted above, though, the population growth will not necessarily be uniform. If, then, we further assume the same 20% of the electorate is Hispanic, 63% of whom vote for the Democratic candidate, the Democratic Hispanic margin over the Republicans would grow to around one million votes. Assuming a 25%/75% split, as was done above, would increase that Hispanic margin to about 2 million votes. But is that bar too high or too low to account for active Hispanic voters moving over to the Democratic column or latent Hispanics being activated by a partisan battle over Sotomayor? And, as always, will it even matter three years down the road when the next presidential votes are cast? *The hypothesis here is that Democratic states -- especially solid Democratic states -- would see increased turnout regardless of competitiveness while solid Republican states would witness lower turnout rates. First, the "Maria" Sotomayor blunder and now an apparent endorsement of Marco Rubio in the Florida Senate race (Man, I've got to read those Huckabee emails more closely!). Huckabee'll have to clean this sort of thing up some before 2012 if he intends to run. Not a good day for ol' Huck. At least he isn't biting into unshucked tamales yet. First, we'll need to assume a couple of things. For starters, everything below assumes that the primary calendar and rules will remain virtually unchanged between now and January 2012. We can argue all day about the likelihood of major reforms to the primary process, but for the sake of this exercise, let's assume that Iowa, New Hampshire, South Carolina and Nevada lead the way followed by Florida and then Super Tuesday. We also need to assume that Charlie Crist not only takes the GOP nomination for Senate in the Sunshine state, but wins the general election as well. At this point, these assumptions have a better than 50/50 shot of being the political reality in 2012 as I see it. [Likelihood of disagreement with those odds? 100%.] With that said, how does this get Crist closer to the vice presidency and why doesn't that improve the Florida governor's chances of gaining the GOP presidential nomination? Well, all this started as a brainstorm that emerged from the comments to the Palin post the other day. The discussion there stretched from recent vice presidential nominees later running for presidential nominations to the importance of the 2012 primary calendar. And that got me thinking about Charlie Crist. As was the case in 2008, Crist's endorsement will be very much sought after in the race for the GOP nomination in 2012 due to the importance of Florida. But let me explain why I think that is. That aside, though, why is a more conservative candidate more likely to emerge from the Republican side due to the calendar? Iowa and it's very conservative caucus electorate will be hugely important and will have a large say in who the nominee is. Yeah, that's not saying much. Iowa always has a disproportionate influence over the process given its position. But depending on who runs, Iowa could have an even greater impact. 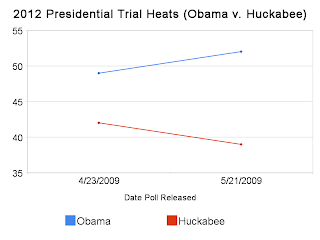 If Huckabee runs, he'll be expected to turn the same trick he did in 2008. If the former Arkansas governor opts out to wait on 2016, then Iowa becomes more important. Here's why: If Mark Sanford runs, South Carolina's impact will likely be minimized. Nevada faces the same issue if Sen. John Ensign decides to run as well, but Nevada has to worry about timing as well. If the Silver state's primary coincides with South Carolina's primary again, that'll be a double whammy against GOP caucus-goers in Nevada. Well, what about New Hampshire? Ah, the Granite state. Romney is far from a favorite regional son (former governor of neighboring Massachusetts, but with roots in Michigan and Utah), but my hunch is that Romney will be expected to do well there and will likely be positioned well enough to do so. Does that mean a win is a sure thing? No, but he'll be in good shape to claim the primary. Any one of those states could have an unbiased influence on the states to follow minus their favorite sons or past winners (and not all will be viable if they choose to run), but there are reasons to believe there could be a massive split heading into Florida. Huckabee could very well win Iowa again. It isn't a stretch to see Romney winning New Hampshire either. He did place second there in 2008. Sanford is still seen as a legitimate dark horse right now and could become just legitimate by 2012. And it isn't out of the question for a local candidate to do well among a small caucus electorate like Ensign in Nevada. Would the senator even be considering this if Nevada wasn't so early in the process? There are any number of combinations from the above possibilities, but let's assume that all that comes to pass and Florida becomes the de facto tie-breaker heading into Super Tuesday the next week. If you're Charlie Crist, what do you do? "Hey! Florida is the decisive state here. I could win this thing!" "Hey! Florida is the decisive state here. I could win this nomination, face a tremendously popular president and never be heard from again." First of all, the influence of endorsements (whether by political actors or newspapers) has still received a far smaller share of attention in the political science literature than it should have (...as Rapoport, et al. (1991) pointed out), and the literature that does exist provides mixed results. But during the valuable invisible primary period, Cohen, et al. (2008) have recently found that endorsements matter as much if not more so than polling (though that is not statistically significant) to fundraising and subsequent electoral success. Regardless, it was the timing of Crist's endorsement of John McCain -- just prior to the Florida primary -- that made it so potentially powerful. 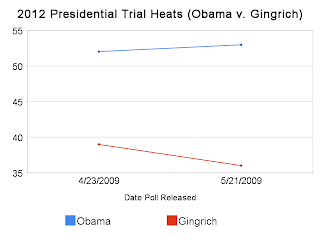 And McCain's "just prior to the primary" endorsements -- Schwarzenegger and Crist among them -- seemed to have at least coincided with more primary success than, say, Barack Obama's endorsements from the likes of Ted Kennedy. And Crist will likely have another chance to influence the nomination. Now, he could throw his hat in the ring himself, but he might be better served by throwing his weight around, successfully endorsing someone and parlaying that into a vice presidential nomination or a prime spot in the 2016 sweepstakes. My money is on the latter there. Crist is, at the very least, politically shrewd. Even if it takes some time, he has shown that he will pick his spots in order to advance his position politically. And 2012 may not be one of those spots. If he is so shrewd, he may want to avoid the vice presidential slot unless victory is a sure thing. Losing vice presidential nominees just have not done that well in winning their party's presidential nomination in subsequent cycles. This isn't really about Crist and the vice presidency so much as it is about underlining the important role Florida -- and its high-profile Republican politicians -- will play in determining the next GOP nominee. ...if the calendar stays the same. The influence of bumper stickers on election outcomes can certainly be questioned (They have an effect? 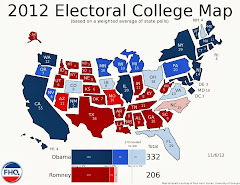 ), but if my trip from Georgia to North Carolina and back (through early primary state, South Carolina, mind you) is any indication, then 2012 will be fought between Mitt Romney and Sarah Palin. ...and Sarah had her's on an Alabama RV in the Gaffney area of northeastwest South Carolina. WASHINGTON – Republican National Committee (RNC) Chairman Michael Steele today announced the appointment of Ohio National Committeeman Bob Bennett, Wisconsin National Committeeman Steve King, Florida National Committeeman Paul Senft, former Maryland Secretary of State Mary Kane, former Michigan Republican Party Chairman Saul Anuzis, former Office of Personnel Management Director Kay James, former Iowa Republican Party Chairman Brian Kennedy, former White House Spanish media spokesperson Mercy Schlapp, and former New Hampshire Attorney General Tom Rath to the RNC Temporary Delegate Selection Committee. “I am proud to announce the appointments of this impressive group of people to the RNC Temporary Delegate Selection Committee. They are all exceptionally qualified people and I look forward to working with them in the future,” said Chairman Steele. The RNC Temporary Delegate Selection Committee serves to review the timing of the election, selection, allocation, or binding of delegate and alternate delegates to the Republican National Convention. In accordance with The Rules of the Republican Party, the RNC Chairman appoints three RNC members and six non-members to the RNC Temporary Delegate Selection Committee, which is already comprised of four elected RNC members. 1) Was the GOP trying to keep this quiet? By releasing this on a Friday -- the Friday before a holiday weekend no less -- this news was bound to receive less coverage than if it had been broken on almost any other day. That certainly seems to have been the case. The Democratic Change Commission's announcement garnered more coverage than its Republican counterpart. Granted, I'm on the road and wasn't as on top of things today as I usually am, but still, I had to search for mentions of this announcement. Color me perplexed. 2) Take a look at the new members of the committee. All nine are from blue states. Ohio, Wisconsin, New Hampshire, Iowa, Florida, Michigan and Maryland are all represented as are Virginia (Kay James) and Florida again (Mercy Schlapp). Most importantly -- to them at least -- Iowa and New Hampshire have a seat at the table, but so do upstarts Florida and Michigan. Ohio GOP chair, Bob Bennett has been pushing the Ohio Plan for a while now (see here for more). But where are Texas and South Carolina, or for that matter, any southern state? This provides at least some indication of the direction Michael Steele will take the party. It is a nod to the need to expand the party outside of the South. But to have no southern states represented? That's certainly a break from the past. The full committee is due to issue a report with recommendations on the rules of the 2012 primary season next summer and FHQ will have an eye on the progress between now and then. 1) As I mentioned in the Palin post the other day -- and as Jack reiterated -- Palin is purported to be a grassroots candidate, but her support in the polls seems to be dropping off. Political insiders v. the masses? Maybe not. It could be insiders/masses v. Palin supporters. Of course, the Alaska governor drew more support than the candidate FHQ has tabbed as the favorite for the GOP nomination [but what do I know?]. 2) Is Romney doing worse with Huntsman out of the race? Sure, that's a coincidence, but the drop off isn't anything to sneeze at. 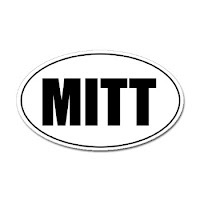 And with the debate shifting in recent days to foreign policy (Gitmo in particular), Romney, the economy candidate, is pushed further out of the picture. 3) It is early, early, early, but it is still nice to have some data to look at. 1) The Hawaii Republicans' move from a May convention to a February caucus shifts it into a concurrent delegate selection event with island Democrats but also makes it the first frontloading state of the 2012 cycle. Often the convention system and caucus system are one and the same, but in this instance I think Hawaii is shifting the actual delegate allocation to an earlier date. In the past Hawaii Republicans have held precinct meetings as early as January (see here, here, here, here, and here), but that likely did not have a direct effect on convention delegate allocation. What we'll likely see from Hawaii -- barring any further changes -- is something akin to what Wyoming Republicans did in 2008. Wyoming allowed for approximately half of their delegates be allocated based on the results of the first step precinct caucuses and the remainder to be divvied out at the final step convention. I would assume that this will be the case in Hawaii as well. Otherwise, the frontloading move isn't all that big a deal considering the fact that Hawaii Republicans have technically had January contests five primary seasons since 1976. 2) The number of days Hawaii moved (87 days) is based on the assumption that Republicans in the Aloha state would have held -- and still might hold -- their convention during the third weekend in May in 2012. 3) Finally, because Florida, Indiana, Minnesota and North Carolina are officially off the list of potential movers as of now, the links for their legislation will be removed from the calendar. I will keep them live in the past versions -- all of which I'll append to the sidebar primary calendar like I used to with the electoral college maps. And why does Georgia's legislation keep its link when the General Assembly has adjourned? That legislation will carry over to 2010, so we'll consider that "active" legislation to change the date of the Peach state's presidential primary. The Political Insiders Poll that the National Journal has done is enlightening. The most interesting bit asks partisans to name the current governors within their parties with the brightest futures. Check out the poll link above for the full details, but for our purposes, allow me to focus solely on the Republican side. That's where the action is anyway. This isn't the greatest of news for Sarah Palin. Seven other current Republican governors top the former vice presidential candidate and the Alaska governor surpasses only the Governator and no one on the list not to mention the 13 other Republican governors. Still, out of 99 votes, Palin managed to garner only 5 votes. That's a pretty low number for a former vice presidential candidate. ...in the year immediately following the presidential election where said person was on the ticket. But here's the rub: This poll was conducted among political insiders, not at the mass level where her support would be expected to be highest. 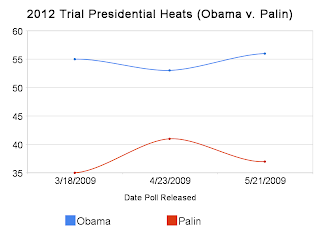 Now, we could look at the Google Trends data where Palin is doing well relative to other potential candidates, but I don't know that the information we have there jibes well with the scant polling on 2012. Palin has actually polled quite low in those surveys which could suggest that the frequency of Google searches for her are propped up by the types of folks who like to gawk at car accidents -- accidents like the Levi Johnston dust-up. File this one away, though. 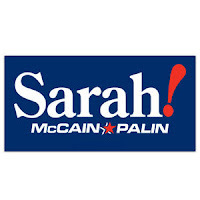 If Palin enters the race, the tension between these two camps will decide how well she does. When Did Primary Become a Verb? Nothing like a slow death in committee. Monday came and went and as the clock struck midnight, the Minnesota legislature adjourned for the year. 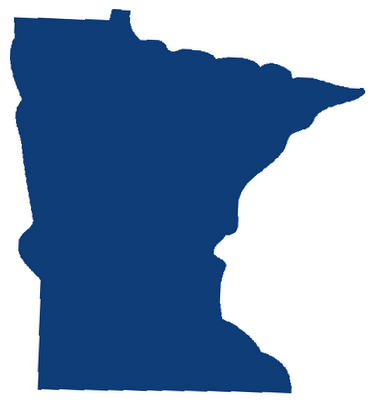 While a bill to shift the state's general primary from September to August passed (and awaits Governor Pawlenty's signature), both HF 31 and SF 157 were left languishing in committee, postponing for at least a year the decision to make the switch from a caucus system to a primary. The House bill hadn't budged since being introduced in mid-January. On the other hand, the Senate version made it out of the State and Local Government Operation and Oversight Committee with a "Do Pass" authorization, but got held up once it was re-referred to the Finance Committee. [I suppose there comes a time when you actually have to consider paying for these things.] But neither ultimately made it through and the Land of 10,000 Lakes will have to wait to make the switch from caucus to primary for at least another year. And it is likely that any future bill's success will depend in large measure on how well the state is doing economically. 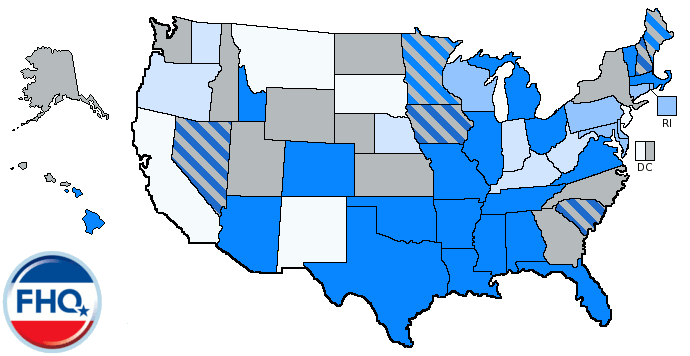 In the meantime, though, mark another state off the list of potential 2012 movers. Over the weekend, Hawaii Republicans at their annual convention voted down the convention system they have used for allocating Republican presidential nomination delegates in favor of a caucus system. In the process, Aloha state Republicans scheduled the 2012 caucuses for third Tuesday in February. That would bring the contest in line with where Hawaii Democrats held their caucuses during the 2004 and 2008 cycles. Now, this is a tentative date at this point. There were two proposals that could have been on the table at the state convention. The caucus plan obviously, but there was also a plan for a closed primary that passed the county convention stage but was withheld by the Rules Committee for the Hawaii GOP. The latter plan may come up at a convention in the future and change the date of the GOP's delegate selection event in the Aloha state. However, we can pencil the Hawaii GOP caucuses in for February 21, 2012 until such a time. This move makes Hawaii the first state to frontload a presidential nomination contest for 2012. And it is funny: Arkansas and Hawaii, for all intents and purposes, switched places on the calendar. Arkansas moved from February to May and Hawaii's GOP shifted from May to February. NOTE: 2012 Primary Calendar update coming later in the day. Is it just me or is anyone else bothered by this recent bit of vernacular short-handery? For example, Merrick Alpert to Primary Senator Christopher Dodd. Is it that hard to say, "Merrick Alpert to Challenge Senator Christopher Dodd in a Primary?" Or better yet, "Merrick Alpert to Challenge Sen. Chris Dodd in a Primary?" I mean, there are two examples of already established short-hand. And why is the use of the verb primary confined to this particular race? [I've seen it used elsewhere, too.] It all just seems as silly as the Republicans calling the Democratic Party the Democrat Party or the Democrats childishly responding by calling the GOP the Republic Party. Of course, what should not be lost in this curmudgeonly rant is that Chris Dodd is being challenged in next year's Connecticut senate primary by a former aide of Al Gore's. Who Had May 15 in the Office Pool for Jon Huntsman Joining the Obama Administration? The new, embeddable Google Trends Gadget will come in handy I think. I'll still put together the monthly posts (Where is that April one again? ), but this gives everyone the chance for one-stop, do-it-yourself searching on the possible contenders for the 2012 Republican presidential nomination. The plusses are obvious, but let's talk a bit about the minuses with the gadget. First, just like the Google Trends application, you are limited to just five search terms. When we're talking about 8 or 10 or 12 possible candidates, though, you've got a problem. Fortunately, there's a something of a work-around. Don't like Tim Pawlenty occupying that fifth spot? Fine, click "edit" in the upper right corner of the figure and substitute Bobby Jindal or Kay Bailey Hutchinson or John Huntsman [oops] Thune/Ensign. This is where the monthly aggregations of this data will be helpful: putting everyone -- all 10 or 12 candidates -- side by side. I would also like to have this thing up and refreshing in the sidebar in real time, but the parameters of the gadget make it too large to fit there. My attempts to resize it only altered the frame size, not the graph itself. The smaller I made it, the more the frame zoomed in on the upper left corner. The proper dimensions for the sidebar left me with Mitt Romney and Newt Gingrich's names and a couple of Sarah Palin's peaks from the line graph. Not an ideal visual representation. What I'll do then is similar to what I've already done with the primary calendar maps in the left sidebar. I'll put one of the graph pictures in its own sidebar widget and make the picture a live link to this post/gadget so you can have an updated look. I'll also periodically update the picture (weekly? ), so that it doesn't stagnate. I think that's it. Happy candidate tracking. Earlier this week FHQ examined the current state of 2012 frontloading in the context of the 2009 state legislative sessions. The idea there was that time is running out on state legislatures with bills proposing the movement of presidential primaries. The logic was that many legislatures are nearing the completion of their sessions, but that fails to recognize state-specific rules of legislative process. Sure, states technically have until the close of the session to act, but in North Carolina the General Assembly requires that bills make it out of their originating chamber prior to a certain date. In 2009, that date was this past Thursday, May 14. And S150, the bill that would move the Old North state's presidential primary from the Tuesday after the first Monday in May to the first Tuesday in February, was successfully bottled up in committee just as it was two years ago when a very similar piece of legislation met the same fate. Again, the circumstances are nearly identical. A Democratic committee chair on the Elections Committee in the North Carolina Senate blocks a Republican-spearheaded proposal to move the state's presidential primary. Of course, Democrats are even less motivated now versus two years ago to move the primary since its only benefits would be enjoyed by Republicans with a competitive primary. North Carolina, then, joins Florida and Georgia as states where proposed frontloading bills were allowed to lapse in committee (though Georgia's will be carried over to the 2010 session). Huntsman in 2016 (James, posting over at RedState, is a former student of mine, so I have to get that link in there.). Here's the thing on Huntsman: This is a shrewd political move. It augments his executive experience and enhances his foreign policy credentials (He has already served as ambassador to Singapore in the Bush 41 administration and took an LDS mission trip to Taiwan.). By working with Obama, it shows Huntsman's capacity to operate in a bipartisan way. He avoids the two Mormons is better than one problem, he would have faced if he and Mitt Romney were to enter the fray in 2011 or so. Michael Steele seems to think this is an issue. And finally, and this can't be understated, it allows the soul-searching within the Republican Party to more fully develop. More negatively, that soul-searching could be spun as infighting, but I'll stick with the more positive angle. 2012 may yet be a good year for the GOP, but through the current lens that is difficult to see. 2016, an open seat and chance for Obama/Democratic Party fatigue looks a lot better electorally. But one thing's likely for sure: we can probably take Huntsman out of the 2012 candidate emergence data. I like having ten candidates being considered, so who should replace Huntsman (who FHQ had a soft spot for, I might add.)? If I had to choose, I think I'd opt for John Thune. Thoughts? Comments? You know what to do. Sure, I could have put Giuliani in that byline at the top as well, but this is the first time he's been polled in the handful of 2012 polls. That isn't anything monumental, but the total lack of chatter around a repeat bid for America's Mayor, to me, is telling. And let's not get started on this Giuliani thing again anyway. It isn't like 2008 turned out well for him. Polling propped up something that wasn't there. We can argue about the merits of Google Trends data all day, but it does show that while Rudy was up in the polls, he wasn't drawing many web searches. Regardless, if he continues to poll like this, the former New York mayor may consider throwing his hat in the ring. But what about Huckabee and Romney? And hey, I've gotten this far in to a post on 2012 without mentioning Sarah Palin. Let's deal with the former first. These are more solid polling numbers for Huckabee. The thing that is striking to me is that the former Arkansas governor is doing so well (relatively speaking -- It is just 16%.) among independents polled by FOX. Giuliani besting him with that particular group isn't a shock, but seeing Huckabee atop the list of remaining prospective GOP candidates for 2012 is still something I need to think some about. This is the guy whose stalking horse in the January RNC chair race, Chip Saltsman, was dubbed, along with fellow southerner, Katon Dawson, a symbol of the Republican Party's inability to stretch its success any further than the South. I thought Huckabee would be there in 2012, but I didn't see support necessarily coming from this direction. For Romney, it's good but not great news. He's among the top candidates, but not tops. And he's still losing to a guy who was able to beat his money with better organization in Iowa in 2008. The former Massachusetts governor is still within the margin of error of Huckabee with both groups sampled in the poll. And Sarah Palin? 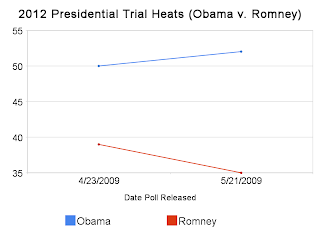 In 2009, three years before the contests begin for the 2012 cycle, the presidential nomination race is all about name recognition, and it says something that the power of the former vice presidential candidate's name has decayed to the point that she is barely garnering double digits in one of these polls. There are a lot of names in this poll, but for someone who was a potential number two, not to mention someone with such a loyal following among conservatives, this is yet further evidence of the Alaska governor's 2009 slide. Finally, it is nice to see Mark Sanford included in the polling. The South Carolina governor's name has been in the news because of his reaction to the Obama administration's stimulus plan, and has been mentioned in the context of a 2012 run, but he hadn't appeared in any polls as of yet. Also, it is nice of FOX to throw in the Jeb Bush wildcard to test for Bush fatigue. It looks like it is still too soon for another Bush. Yeah, it has only been four months since the last one left office. I think that qualifies as too soon. Hat tip to GOP12 for the link. As was witnessed recently here in Georgia, a bill to shift the Peach state's presidential primary back to March for 2012 was introduced on the last day of the General Assembly's session. The intent in that instance was to introduce the bill in order for it to carry over to the 2010 session, but it got FHQ thinking about the time left in other states where frontloading (or backloading) bills have been introduced. And in reality, there isn't much time left. Arkansas and North Dakota were able to move on their respective bills prior to the close of their legislative sessions and Indiana's Senate was able to sign off on a resolution forming a committee to examine the possibility of frontloading. In the remaining states, however, things are either dead or stuck in committee. Florida's adjournment last week killed the two bills proposed to move the state's controversially scheduled primary back to spot in line with both parties (2008) nomination rules. Frontloading bills in North Carolina, Oregon and Texas have all been left twisting in the wind in committee while the bill to eliminate the separate February presidential primary in New Jersey has met the same fate. The difference -- and it is a slight one considering the New Jersey bill was one introduced in 2008 and will die prior to elections there this fall -- is that the clock is running out in North Carolina, Oregon and Texas. By the middle of July, all three states' legislatures will have adjourned and without action, will kill these bills in the process. Meanwhile, the creation of a presidential primary in Minnesota is down to its last week with the legislature closing up shop next week on May 18. The Senate bill has emerged from the committee concerned with elections with a "Do Pass" designation and has been re-referred to the Finance Committee, but the House bill has gone nowhere since being introduced in January. In Oklahoma, the bill to have parties pay for their own presidential primaries -- something that has elicited more and more talk recently -- like the Minnesota House bill mentioned above, hasn't seen any action since being introduced. That isn't really the type of momentum you'd like to see if you're a proponent of this measure before the session goes sine die at the end of the month. Similarly, the two bills to separate state and local primaries from the presidential primary and shift them to later dates in Illinois have been stuck in committee as well. Like New Jersey, though, the legislature in the Land of Lincoln is a professional legislature (For those outside of political science, that professional refers to a legislator's duties being his or her main profession, not that a part-time legislaure is any more or less professional than a full-time one.). The clock then, won't run out until the next election changes the membership of the chambers. Finally, the bill in New Hampshire stipulating that only Iowa's caucuses could precede the Granite state's presidential primary is likewise stalled in committee. None of this is particularly surprising given that 1) it is still really early for 2012 primary movement and 2) most states are playing the wait-and-see game with how the parties will set their nomination rules for the 2012 cycle. And that largely fits with the cyclical logic espouced here. Of course, if that trend holds, we should expect to see even fewer bills regarding presidential primaries introduced next year. Woe is FHQ, woe is FHQ! Eh, we'll find something to talk about. All that talk about a public hearing and all the Texas House Elections Committee did was punt the decision on the bill (HB 246) to a later date. The chair laid out HB 246. The chair recognized Representative Alonzo to explain the measure. The chair recognized Representative Alonzo to close on the measure. Now, I still need to go back and look at the video of this on the Texas legislature's web site, but I can say this: The witness list is pretty telling. Texas Secretary of State Elizabeth Winn weighed in on the bill, and then a host of folks came forward (vocally or not) as against the measure. How many were for it? Zero, nada, zilch. That says something. It may be that Republicans in the state ultimately come to the table and help push this frontloading bill (moving the presidential primary from the first week in March to the first week in February 2012) through, but there won't be any happy campers on the local level. FHQ will continue to track the progress and I should be able to augment this picture a bit soon with a bit of an addition to this and other legislative movement on the frontloading, er... front.